What my bosses, class instructors, clients, and friends say about me. Kianoush has excelled throughout the application development BAS degree program at North Seattle College and has maintained above a 3.9 GPA. He is an active contributor within the classroom and collaborates well with other students. 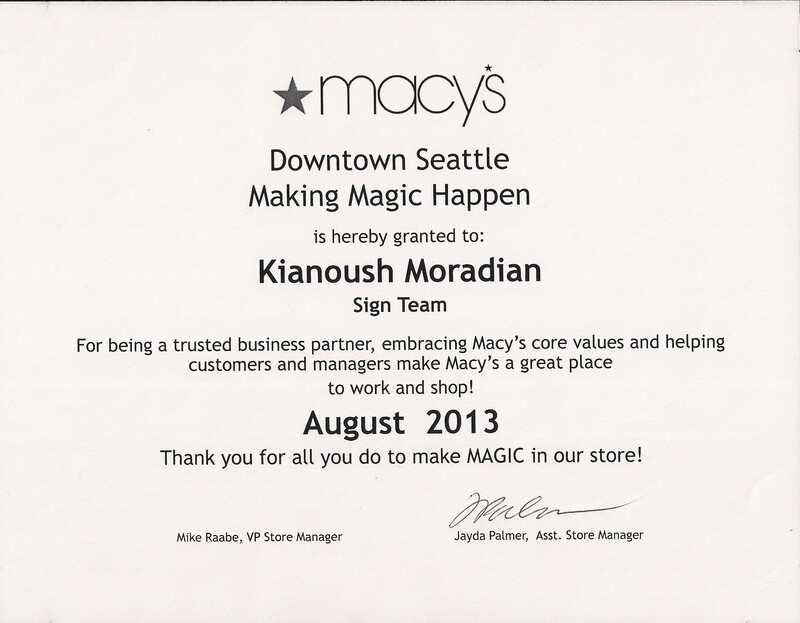 Kianoush is a driven individual who sets goals and works hard to accomplish them. He is also a great communicator that can bring an immense amount of skill and ability to wherever he chooses to work. "I am very happy to recommend Kianoush, and know he will excel as soon as he is given the opportunity. Kianoush continuously impressed me with his ability to absorb, internalize, and implement the new concepts I would introduce almost immediately, no matter if it was systems, networking, or scripting. I’m confident Kianoush will become a highly valued member of wherever he decides to go." 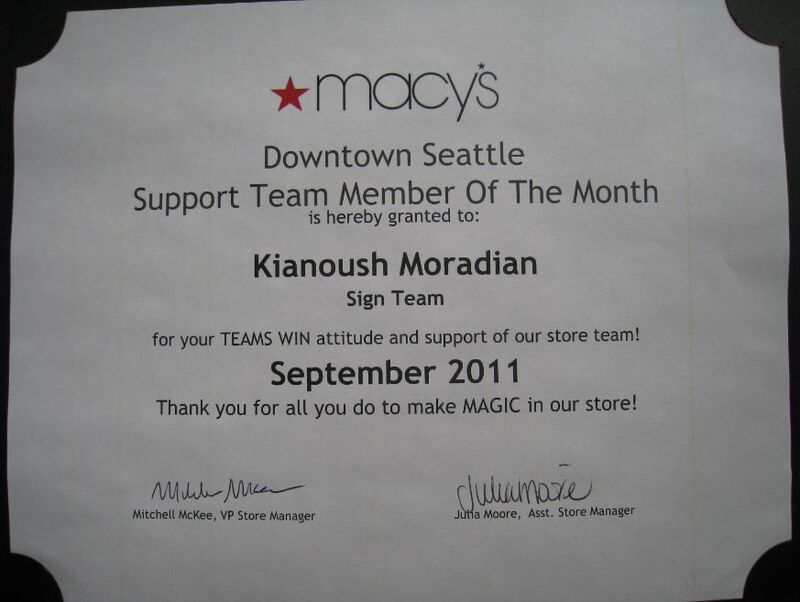 "I would like to recognize Kianoush Moradian as our support employee of the month. Not only is Kianoush reliable & efficient in his responsibilities but he also a great team partner & leader doing other tasks throughout the building.Thank you for your professionalism and positive attitude." "Kianoush has a key ingredient for excellence in web development: a curious mind. He listens attentively, asks thoughtful questions, experiments to explore new ideas, and learns from everything he does. The work he produced in my web design class consistently showed a solid understanding of coding principles, admirable attention to detail, and dedication to learning as much as possible. It was a real pleasure to have Kianoush in the class, and I feel confident that any client or employer will appreciate working with him as much as I did." "I had the pleasure of meeting Kianoush Moradian during the Spring Quarter of 2011. As an instructor at Seattle Central Community College and the International Academy of Design and Technology, I have the opportunity of interacting with many students, and helping them to achieve their goals. Kianoush is a highly intelligent, dedicated and hardworking student. Kianoush thinks “out of the box” and exhibits great creativity. He creates exceptional imagery for all facets of communication and continually shows me outstanding work (in web design/development) and growth that surpasses expectations. Most importantly, Kianoush has an appetite for learning and problem solving. So many students in today’s academic world only seek the “answer” to the problem, without understanding the process. Kianoush is truly the exception. I highly recommend Kianoush for a position in web design/web development. I strongly believe that with his talents, curiosity and motivation, he is on the road to success." "If you have had the chance to work with Kianoush you will know he is the most honest and caring person you can ask for. From the first time Desiree and I met him we knew we could trust him with anything, and that he would not only keep his word, but pull his weight. That is in-fact what happened when we started working with him – he can take a project from start to finish and has some of the best communication skills in the business." "Kianoush did good work to requirements and delivered it on-time. He was a pleasure to have in my classroom." "You were one of the most successful students I've had in a long time. Great discipline." Thank you for all your efforts and especially your good attitude!